Nematodes can substantially reduce the yield of watermelons. The affected plants are stunted and chlorotic. 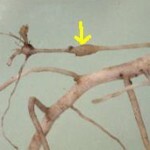 Root-knot nematodes can cause galling on roots (Image 1), but there are no visible root symptoms with the reniform nematode. The root-knot nematode occurs primarily in sandy soils. Although nematicides can provide an economical control, a crop rotation with corn or sorghum and a weed-free fallow can reduce numbers of nematodes below damaging thresholds.